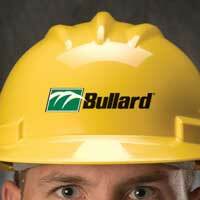 Customized hard hats present your logo in the highest quality. Pad printed logos are permanent and will not peel crack or fade like a decal or sticker. There’s only a 20 piece minimum order required for custom logo work! No hidden charges. No set-up charges. No artwork charges. 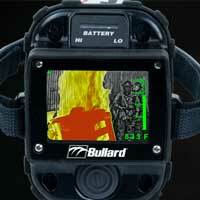 Bullard Logo Shop offers the fastest delivery in the industry. Our advanced pad print technology allows us to print crisp, clear logos in up to six colors and in eight locations. Factory installable Scotchlite® stripes offer improved visibility and work group differentiation. Check with the person that made the logo, they probably have something that will work. Or, try the printer who prints your business cards. You are looking for “vector” or “line art.” This is usually a file with an extension of .eps, .fh, .ai and sometimes .pdf. (Don’t worry if this is a file type you can’t open, just send it to us and we’ll check it out for you.) If a .jpeg, .tiff or .pdf file is all that is available, Bullard will need to re-create your logo, but there's no charge for this. It does, however, increase the time it takes to create a proof for you. In many cases, this is included in the digital version of your logo. Because color is highly subjective, and different computers and printers show colors differently, the Pantone Matching System (PMS) is the universally accepted system used to identify colors. Please specify the PMS color for each color in your logo. Your logo can be printed in any of eight locations on your hat: middle of the front, middle of the back, front and back temples, and the sides. Approve the proof when it arrives and we’ll have your customized hats on their way to you in a few days. Send us the logo files you do have. We can re-create your logo from a high-quality print piece at no additional charge, though this will add a little time to the process. Our Logo Shop is happy to work with you to help you get the best looking logo on your hard hat.